"A romance ahead of its time." 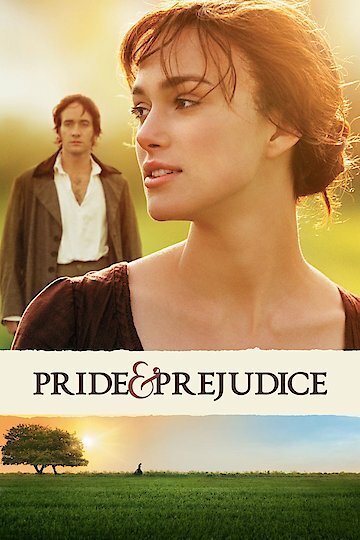 In the film Pride and Prejudice an 18th century neighborhood in the English countryside is all aflutter when an eligible bachelor takes up the empty estate of Netherfield. New bachelor, Mr. Bingley, is well-liked in the neighborhood but his friend the arrogant Mr. Darcy leaves an unfavorable impression, especially with the Bennets' second daughter, Elizabeth. The oldest, Jane, however is taken by Mr. Bingley. During a visit to Netherfield Jane becomes ill and Elizabeth must tend to her, bringing her into close contact with Mr. Darcy once again where she proves herself to him in battles of wit. At home, the handsome Lieutenant Wickham earns Elizabeth's friendship through the revelation that he has been poorly treated by the same Mr. Darcy that she has come to despise. Fate again throws Elizabeth in Darcy's path at a Netherfield ball when he insists on a dance with her and she insists to her closest friend Charlotte that she will continue to hate him. Bingley abruptly leaves Netherfield and a heartbroken Jane. Elizabeth visits newlywed Charlotte and meets Lady Catherine, a haughty woman whose daughter is engaged to Mr. Darcy. It is from Darcy's own cousin that Elizabeth learns of Darcy's blame in Bingley's spurning of her sister. Directly after this revelation she is sought out by Darcy himself who surprisingly proposes to her but claims that he does so in spite of her inferior rank. Offended, Elizabeth vehemently refuses him. Darcy later leaves her a letter that alters her opinion of him. Elizabeth takes a trip with her aunt and uncle to the district where Darcy resides. On a tour of his manor they are met by the man himself who asks the family to meet his sister. Their plans are ruined, however, when Elizabeth receives a letter saying that Lydia has eloped with Wickham. Elizabeth tells Darcy before she leaves for home, where the Bennets fearfully await news. Elizabeth's uncle writes that he found the pair in London and that they have been married, sparing the family from shame. Lydia later admits to Elizabeth that it was actually Darcy that found the pair and paid for the marriage. Upon returning to Netherfield, Bingley proposes to Jane. Soon after, Lady Catherine arrives and demands that Elizabeth let go of any claim to Darcy. Although she has none, Elizabeth spiritedly refuses. Elizabeth soon meets Darcy who makes a new proposal and Elizabeth accepts. Pride and Prejudice is currently available to watch and stream, download, buy on demand at Showtime, Amazon, Vudu, Google Play, iTunes, YouTube VOD online. "Longbourne," based on the not-yet-released novel, will re-imagine the classic love tale of Lizzy and Darcy... as seen from the perspective of the servants. Hit or miss concept?